Quintessentially British and utterly civilized, there is nothing quite like afternoon tea at The Savoy Hotel in London. My husband and I took afternoon tea at The Savoy on our third date and it is a memory that I dearly cherish. We sipped tea while feasting on the most delicious array of treats and finger sandwiches, such as scones, pastry swans, prawn and spring onion sandwiches with sun-dried tomato bread and roast beef sandwiches with horseradish cream. The next time that you find yourself in London, put on your prettiest dress and treat yourself to a touch of indulgence-spend an afternoon taking tea at The Savoy. Patricia Ross Cress writes in That Tea Book, " It is a near-perfect setting, a trompe l'oeil garden surrounds you, complimented by beautiful Art Deco mirrors. Settle down in a comfortable sofa and wonder at the unparalleled ambiance". This entry was posted on 8:27 AM and is filed under High Tea , London , The Savoy Hotel . You can follow any responses to this entry through the RSS 2.0 feed. You can leave a response, or trackback from your own site. You are so right...I did this many years ago when I was visiting London with my family. My mother and I went and it was fabulous. Love your blog...just found you and have just read several of your posts. I'm a follower and look forward to more. Welcome to Blogland! Hi LPC! I have not had the pleasure of having tea at the Connaught, though I am sure that it is quite nice. My husband and I have had cocktails at the Coburg Bar (at the hotel), which is very stylish. Your hubs officially rocks. Mine is less than willing to experience high tea! Lovely! 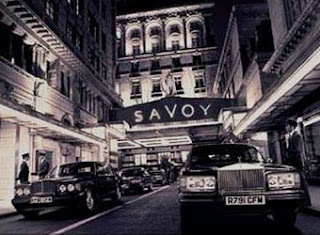 I have had high tea in London, but not at the Savoy. I will need to try it next time I am there. Which hopefully will be sooner than later!